Shops to open in Detroit, Washington D.C.
Magazines may be struggling on the newsstand, but there’s at least one place where they’re still a hot commodity: airports. Now Forbes is taking advantage of the age-old relationship between print mags and weary travelers with the launch of its latest brand extension, licensed airport newsstands. 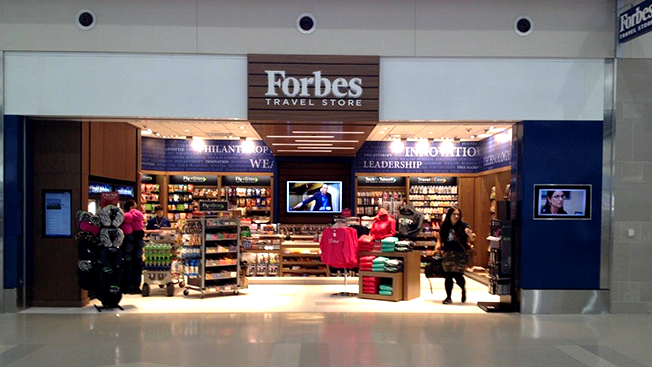 Through a partnership with Paradies, which owns and operates a variety of different airport and hotel stores (including CNBC and New York Times branded shops), Forbes has already opened its first newsstand in Detroit’s Metropolitan Wayne County Airport and will soon open three more in Washington Reagan and Washington Dulles airports. Along with the usual newsstand and convenience store fare, the shops will feature TVs streaming content from the Forbes video network and interactive touch-screen computers on which customers can browse Forbes.com. Throughout the year, the newsstands will run in-store promotions around various Forbes editorial franchises. Forbes has been getting into some unusual brand extensions over the past year—take, for instance, the Forbes Media Tower in the Philippines or the Forbes School of Business at Ashford University in Iowa—but this latest one seems right in line with the company’s magazine roots.